Whether you love listening to this fabulous instrument or enjoy playing it, we welcome you to join us, the Suffolk Organists' Association. Each year we publish a Journal. We offer opportunities to visit churches throughout the county and further afield, recitals and lectures. We offer bursaries and advice to those of any age who would like to advance their abilities with the instrument. Members will be delighted to have received our SOA Journal 120 edited by James Crowe and thank him for his stewardship of this excellent publication. 14 year old Adam Chillingworth accompanied the whole of Evensong Service at St Mary le Tower including Stanford in B flat and 16 verses from Psalm 119. Martin Ellis remarked that "It was really a professional performance. Well done Adam!" Harrison Cole, organ scholar at Wells Cathedral, has already had a very busy nine months playing for more than one hundred Services including the Midnight Service at Christmas with a congregation of nearly 1000. Alex Evans, who won the Advanced Class last September, has been appointed DOM at Hinde Street Methodist Church – part of the West London Mission – from later this summer. We congratulate him on this extraordinary achievement at the age of 18 in such an important Church in Methodism. He has been the organ scholar at St Thomas’s Brentwood for three years where he has had experience of taking choristers' practices and conducting the Choir during Services. The winners in the Organ Competition on Saturday 22 September 2018 were Recital Class: Jamie Robertson. Advanced Class: Alexander Evans Transitional Class: Alex Taylor Beginners Class: Hannah Meeks Most promising Student Class: Alex Taylor. Congratulations to our youngest member – Alex Taylor – on gaining Grade 5 Organ. In the same exam session he also gained Grade 5 Guitar both with Distinction! Details of up-coming events can be found in the 2018-2019 CALENDAR. 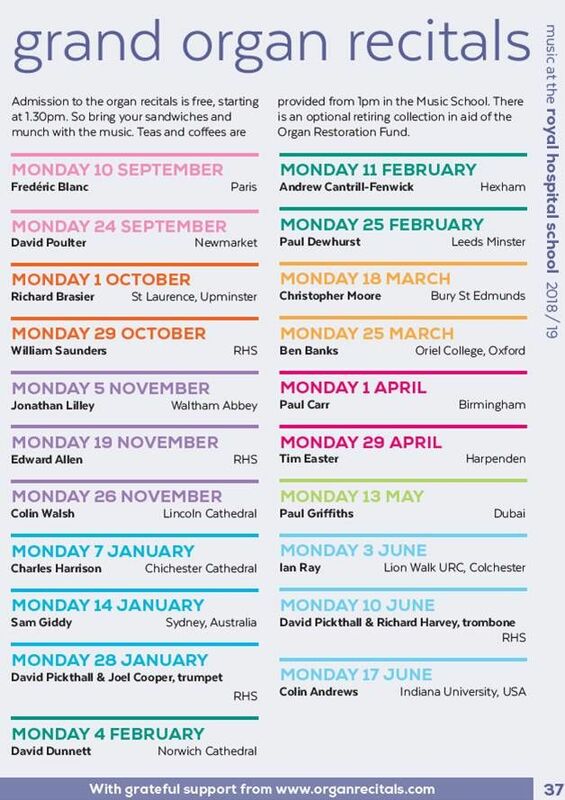 Members will enjoy the East of England Organ Day at Royal Hospital School on Saturday 4 May 2019 which this year has the theme of music for the movies. Details below. These are attended by a loyal but small band of people listening to excellent recitalists. Come along too! A recent recital was by Andrew Cantrill-Fenwick, a former member of the SOA Council but who has relocated to the North of England. His tenure as Organist of the Royal Hospital School Chapel organ gave us the opportunity to hear sounds from this romantic organ which were unique to him and his command of the instrument made it the perfect vehicle for a wonderful programme of a great variety of styles and colours. It is with great sadness that we report the recent deaths of two former Presidents of the Association, Derrick Hibberd and Dawn Harding. Derrick Hibberd was a staunch supporter of the SOA for many years and worked tirelessly as Secretary organising many of our overseas trips and those nearer to home. Last year he was awarded Honorary Membership. A full obituary will be printed in the Journal. Those who enjoy reading the March 2019 edition of Organists' Review will have spotted the fine tribute that Juliette Adams, a member of our Council has written. She writes, " It was with much sadness that I learned of Derrick Hibberd's death in October 2018. From 1984 to 1996 Derrick was Secretary of Suffolk Organists' Association. He carried out his duties with utmost diligence, discretion and efficiency. During his time as Secretary out membership peaked to 160. Events were well supported including trips abroad. Derrick was able to form good working relationships with the Presidents. I certainly appreciated Derrick's firm support and encouragement when I was President of the SOA. He himself served as President when he stepped down as Secretary. Derrick grew up in Sheffield, but lived in Suffolk with his family (four sons) for many years. His father was bery involved in the church music scene in Yorkshire so Derrick had exposure to church music at an early age. Prior to taking on the role of SOA Secretary Derrick was employed as a CID Detective. In his role as Secretary Derrick kept us in good order! He was instrumental in ensuring that the goals of our association were properly managed. The years from 1984-1996 were a very bright chapter for SOA. We remember Derrick with much affection and respect." Dawn Harding died in hospital just before Christmas and was the wife of Past President John Harding. As a non-organist her presidential year also included during organ visits activities for other non-players to do. Her skills in the kitchen were legendary and teas after events took on a whole new level of excellence. Her funeral will be on Wednesday 23rd January at 3.45pm at Seven Hills Crematorium. Earlier in the year, Peter Jackaman, organist for more tham 50 years at Bramford Parish Church died on the 29 March 2018. His funeral took place on 2 May at 11.15am in that church. He was a very loyal member of our Association for very many years. We also remember Don Monro, a stalwart member of our Associaton and a frequent attendee on many of our visits whose funeral was at Thorpe le Soken parish church in January 2018 and another dedicated post holder for more than half a century.